The 3148 Challenger II Brochon Series Bb Flugelhorn is a top choice for the player needing a smoother flugelhorn sound, but with enhancements. The 3148 features a .409-inch bore plus a hand hammered one-piece bell designed for a very quick response. This flugelhorn also features bottom valve springs, 3rd valve trigger and nickel silver outer slides. The 3148 is topped off with a deluxe Elaboration surface treatment and interchangeable sound-enhancing long tubular bottom valve caps. 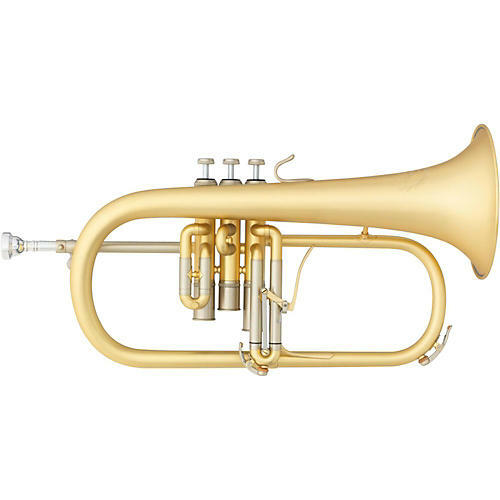 The 3148 Challenger II Brochon flugelhorn includes a case and mouthpiece and is available with a yellow brass bell.